Yesterday Alex T⚜️briefly announced the final release of the UNA 9. Indeed, after more than 3 years since of active development and testing; over 3 MILLION code additions in over 4000 commits; 1300 closed issues and 17 😮 pre-release versions, we finally have the stable UNA 9. 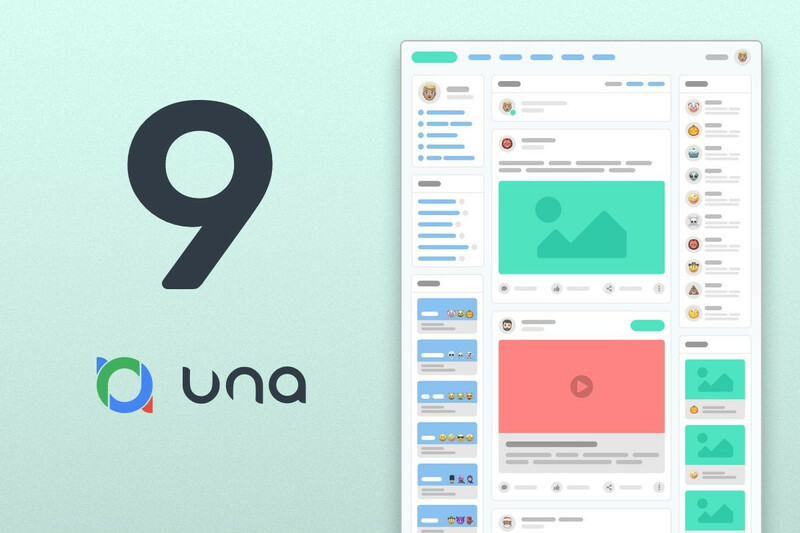 Compared to UNA 8, this version brings hundreds of enhancements, including new modules, system improvements, new integrations, new templates, new objects, new features, etc. etc. Since we decided to make all RCs upgradable the UNA 9 has been tested quite actively by the UNA.IO community and used in production mode for all our clients working with UNA & Boonex team under X-level service plans. It is now considered a stable release, recommended for all sites powered by UNA. More importantly, we now have a core group of really dedicated community members, who committed to the platform and help us daily - asking and answering questions; trying new releases and sharing feedback; creating and uploading new apps to UNA Market; giving us hard time and praising us - all of that keeps the team rolling. As you may see, we're actually entering the stage of active growth, which should further accelerate after this release. It's a very exciting, but also very challenging time. Increased popularity comes with added support overhead and information inputs. We will have to find ways to automate processes, improve documentation, streamline on-boarding and above all - make UNA even better. We highly recommend watching the video and reviewing the Start Guide even if you are familiar with the system. So many times we hear the phrase - "I didn't know I could do that" 😏. Why, UNA 10 of course! Yes, now that we have the 9 released, we are out of the feature-development lockout and can get back to making new awesome toys. Note, that the plan for v10 is to make it a (much) smaller update, adding some features and focusing primarily on streamlining UX (User-eXperience) of all pages. While UNA 9 gives a massive array of features, we should now make everything look and work sleek and clear. We estimate from 3 to 6 months for the 10. Along with the new features and modules planned for v10, we plan to finally introduce first working version of JOT as well as native mobile apps (iOS and Android) based on ReactNative for UNA. Naturally, service updates like 9.1, 9.2 may be released as required in the meantime, addressing any urgent fixes or security issues. Another consideration for us is the commitment to the old Dolphin 7.x updates for Boonex. An update is long overdue and the Boonex community has been suffering without an update for quite a while now. Even though Dolphin will eventually be fully transitioned to UNA-based solution, we still plan to maintain and update the 7.x until we can provide a seamless migration path. So, this will take some time, but we have ideas on how to make both platforms benefit from each other's development. Actually, I mean it - you name it. What do you think would be a good set of names for UNA updates to distinguish between releases? Names of animals from same genus, some fictional characters from books or movies, or perhaps mythical heroes? What do you think would fit? You just release RC13 for bug reports. Now you have version 9 out? I bet bugs reports will start coming in on this release. This was all PR BS. RC11,12,13 were fixes-only with shorter span for each, specifically aimed at making the final happen ASAP. Sure, there will be reports and follow-up service updates, but we are confident that this is a production-ready version that we can recommend as stable. In this short time frame I was able to see the yes -big improvement- of the UNA. Since the RC 12 I am using it in a production site without major problems. Perhaps Sanskrit Cem Bagdatli Andrew Boon ?? I just want to tank the team for making such a great program and I'm using it for my next project. I am making a social network for my country only and without privacy concerns, no ads, no subscriptions, just pure community which will be focused on the user not the benefits that may bring from the user. We will kill the need for users to go to other social networks that only want what's best for them as a company. 3 MILLION code additions!!! Additions - not just the code itself. This is an amazing achievement! Something never before accomplished. Team UNA - take a bow! And thank you for not giving up. Your commitement and hard work is impressive. Amazing work guys I'm utterly thrilled for Version 10! Keep up the amazing work! I'm so excited to see all the new and neat features for V10!